Cleaning is a vital task for restaurants to ensure an enjoyable and safe meal for customers. We offer mopping products with microfiber pads and color-coded mop heads that attract dirt and make cleaning quick and easy. 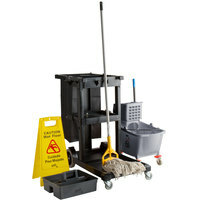 Also, our mop kits provide all of the supplies you need to keep your facility sanitary and clean. For more cleaning products, check out our wet mop buckets and wringers, floor care chemicals, and wet floor signs. If you're wondering where to buy lavex lodging mop kits, we have a large selection of lavex lodging mop kits for sale at the lowest prices.